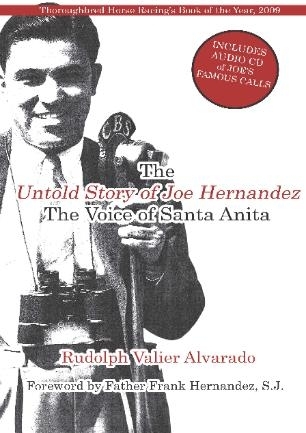 Home > Uncategorized > BOOK REVIEW: “The Untold Story of Joe Hernandez: the Voice of Santa Anita” by Rudolph Valier Alvarado. BOOK REVIEW: “The Untold Story of Joe Hernandez: the Voice of Santa Anita” by Rudolph Valier Alvarado. What is the Story of Your Life? Who are you? Where were you born? Did you go to college? Which school can claim you as an Alumna/us? What was your family like–and were you happy? Have you found vocational fulfillment? Will anyone remember you when you die, or are you content to go unnoticed, and pass into Eternity, in obscurity? Will you leave a legacy behind, or is it OK if you don’t? These are questions that pass through each human heart at one time or another. Some of us are plagued by unsatisfactory answers, and so we set a course to assure that the direction from here-on-out is different, perhaps more exciting. Some of us embellish, because the story so far isn’t up to some standard we secretly hold in our hearts. Others need not alter the tale, as it’s already pretty darned fascinating. But destiny was not content that Joe should use his facility with language strictly for the printed word, for these God-given gifts led him to The Job of a Lifetime. Joe Hernandez, a Mexican-American in the prejudiced 1930s, was beloved by millions–for he was The Voice of Santa Anita. 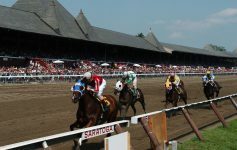 From the track’s first-ever race on Christmas Day in 1934 until, almost four decades and 15,587 race calls later, our hero defined horse racing when racing ran neck-and-neck with baseball as America’s Sport. More famous than all the talking heads of today’s sportscasting, Joe was renowned before the Internet, Facebook, Twittering and ESPN. Radio was the vehicle that drew millions of fans to Joe’s stable, in an age when imagination was necessary and media consumers were required to think. These facts, alone, create a legacy that will live in record books and racing hearts for eons. These could be bulletpoints on a spectacular resume that shames anyone who would be a peer. This, you’d think, is story enough. But his backstory, the real details of his experience, heartache, disappointments and promises that Life made to him and broke–these were unknown until recently. Joe had created an autobio that, while interesting enough–was a soup of fiction and fact. For a man who made a name for himself telling stories, creating a history for himself was not a challenge. The man with the broad, open smile, generous heart and ready word–a “character,” as they’d say–whose lifestory seemed to be as open as his heart–in fact may have been an intensely private person. Whatever his inspiration to create a background that didn’t necessarily jive with the Truth–it was his Truth, the bits of information that he dropped here and there, satisfying those with the craving to know–and keeping his private life, private. It may seem obsessive, to hold the details of one’s life so closely to the vest, but it may have been what Joe needed at that time. Whatever his reasons, whyever he was unknown to those who thought they knew him–his real biography is fascinating, beautiful, heartbreaking, joyful and compelling. And this real story, the book that grabbed me by the throat and forced me to sit with pen in hand and write notes in the margins, just so happens to be the tome that won this year’s Dr. Tony Ryan Book Award, the most prestigious award in equine writing. Alvarado is so masterfully written, so meticulously and thoroughly researched, that I know it was a labor of love. I know this because I am a writer, and I recognize passion when I read it. I know this because I own a copy of the Special Edition of the book, and I feel the need to carry it with me everywhere I go–and I’ve finished reading it. And I know this because, precisely because I am a writer, I am jaded. It’s not often that I pick up a book and attack it with such gusto, appreciation and verve that I tell everyone who will listen that they must buy this book. From a seemingly-chance reading of “Seabiscuit,” in which Hernandez was featured, to the fascination that a Latino man played such a prominent role in 1930s horse racing–to the acknowledgement that he was destined to write the biography of this great man–the author poured an enormous amount of intellectual, spiritual, emotional and financial resources into this historic work of art. The creation of this magnificent book, every step of the way, was a gift from the author to the subject’s legacy; to his children and to the very sport of Thoroughbred racing. 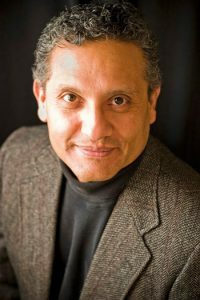 The six years that Dr. Alvarado put into ferreting out the real details and finding the crossroads at which myth intersects with reality–his tenacity at finding the facts and carefully documenting a life worth knowing–have paid off, in spades. This is the single-best biography I have ever read. The author has crafted a work of art that stands on its own: it cannot be compared with any other biography (racing or otherwise) because it is the only member of its species. This book, this rectangle of paper and ink and words that carried me away–this is literature. Caballo Press of Ann Arbor, the publishing house grown from Dr. Alvarado’s literary garden, is the Seabiscuit of equine publishers. As in the story of the little horse who showed ’em how, Caballo Press is small by industry standards. They don’t own a building on Lexington Avenue in New York–or Beaumont Circle in Lexington. In an economy that states, absolutely, that long-shot indie publishers don’t stand a chance–this publishing house is proving that, truly, with God all things are possible. Other publishers–equine and other–have been around far longer than Caballo Press. They employ many more people, and foolishly turn down good authors with terrific story ideas on a daily basis. But they didn’t win the Dr. Tony Ryan Book Award for 2009, and receive the accolades at Castleton Lyons Farm in April. This book–this tome, this graceful, sensual collection of words and soul and promise–took the prize. Seabiscuit bested War Admiral. David slew Goliath. “The Untold Story of Joe Hernandez: The Voice of Santa Anita” grew out of an interest in the life and times of a man the author had never met. The words and intention of his heart prayerfully turned into a book that will grace bookshelves for generations to come, nestling into souls and inspiring others to achieve much. Yes, I’m gushing. I love this book. When I am enraptured, I gush. (But you all know me by now–when I hate something–that’s obvious, too.) I strongly urge you to buy this book, and get copies for everyone you know who loves horse racing. The Special Edition of the book, a copy of which I own, is a treat for the senses: beautifully hard-bound with a glossy, artful cover and bonus CD of 30 of Joe’s race calls. A gift for the eyes, ears and spirit. When Dr. Alvarado took on this project, he had no idea how much of himself would go into the baking of this cake. His personal involvement in the project is obvious, from cover-to-cover. I’m sure that he would not take back one minute of time, one ounce of blood that was required to run this race. Speaking as a writer, I’m tempted to be jealous that a first book can be this marvelous, this well-received and lauded. But as a reviewer of books and obsessive lover of books, of Thoroughbreds and of the sport of racing them–I am eternally grateful that Dr. Alvarado has graced the world with this uniquely gorgeous biography of a man who has long-deserved to be memorialized thus. I only hope that one day, when fame and fortune come my way–Dr. A. will find me interesting enough to write my bio. I can think of no more dedicated a writer to document a Life, or more committed to the project. Dr. Alvarado will on-hand at the Borders in Arcadia, California [400 South Baldwin/(646) 445-1320] on Friday, November 6th and Saturday, November 7th from 10:30AM – 1PM, signing copies of the Special Edition of “The Untold Story of Joe Hernandez: The Voice of Santa Anita.” If you plan to be at the Breeders’ Cup–or if you didn’t score tickets to the big show, but want to catch the excitement of racing at Santa Anita during its heyday–stop in Borders and say Hi to Dr. A. There’s plenty of time to buy a copy of the book and get it autographed before the horses take to the field. Enjoy! YouTube video of Seabiscuit’s 1940 win of the Santa Anita Handicap, Joe Hernandez calling. Previous Article “Horsenameographies”: Who be You be if You be a Horse? Next Article A New Thanksgiving Tradition–Honor Your Horse, Your People, Your Life.